Is there anything more decadent than a rich, creamy, cheesy plate of Macaroni and Cheese? Nope. It’s perfect for a backyard barbecue, and in the dead of winter by a raging fire. Little and big kids alike agree it’s the perfect food. 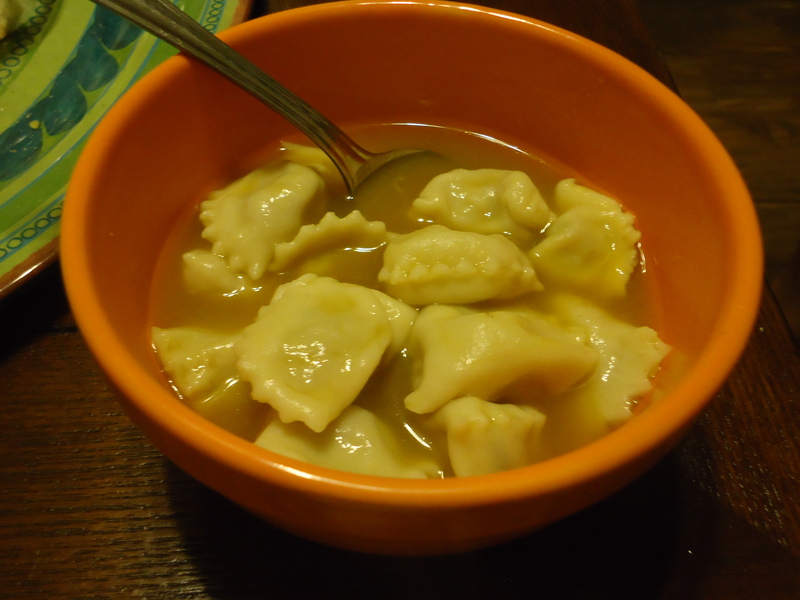 I grew up making my own from the box or heating up the creamy Stouffers’ version as a side. When I left for college, I realized I was the boss in my kitchen and upgraded to entree portions. Here’s my take on this classic dish. Feel free to have it your way, creamy or baked! Put a large pot of salted water on over medium high heat, and add the macaroni when it comes to a boil. Cook pasta for 3-4 minutes and drain. In a large pan, melt butter over medium heat. Add flour and whisk until combined. Continuously whisk the butter and flour mixture for about 5 mins, or until your rue becomes a pale brown and starts to bubble up. Turn heat to low and gradually whisk in the cream to your rue. Once combined, turn up the heat to medium low, and whisk your mixture for about 5 more mins. You should start to see the beginnings of a gorgeous, thick cream sauce. Add in your ground mustard, salt, pepper, nutmeg, and a sprinkle of cayenne. Once incorporated, turn up the heat to medium and whisk in a cup of your cheese. After its combined, add in next cup of cheese. Repeat with final cup of cheese. 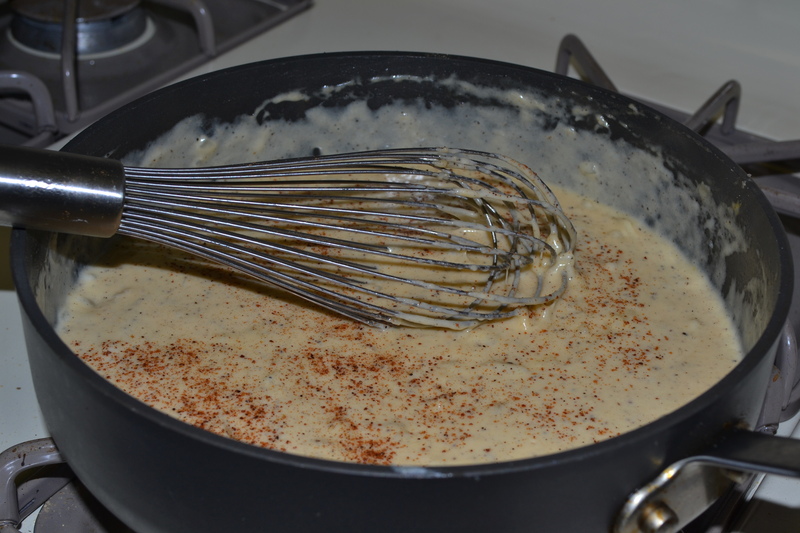 Gradually whisking-in the cheese will give you a smoother sauce without the cheese clumps. Isn’t that sauce gorgeous! I love the pale orange color you get when mixing the two kinds of cheese. This sauce is just dying to envelop those cute little macaroni noodles. Stir your noodles into the gooey cheese sauce. You can choose to stop now if you are a creamy mac fan. Or if you prefer the baked version, sprinkle a half cup more of the sharp cheddar on top and bake for 20-25 minutes in a 350 degree oven. I strongly recommend you make this now…and then top it with crumbled bacon! For the bacon, cook 3-4 strips over medium high heat. 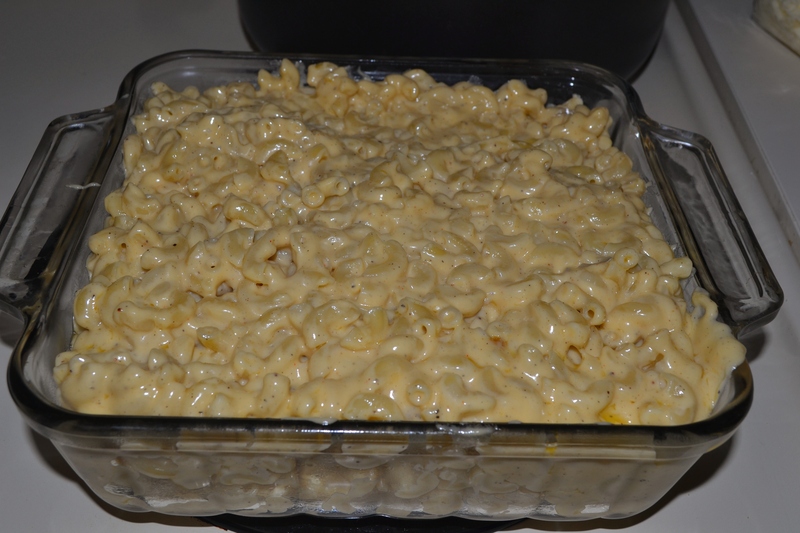 Then add to the top your macaroni and cheese. Enjoy, I know I did. 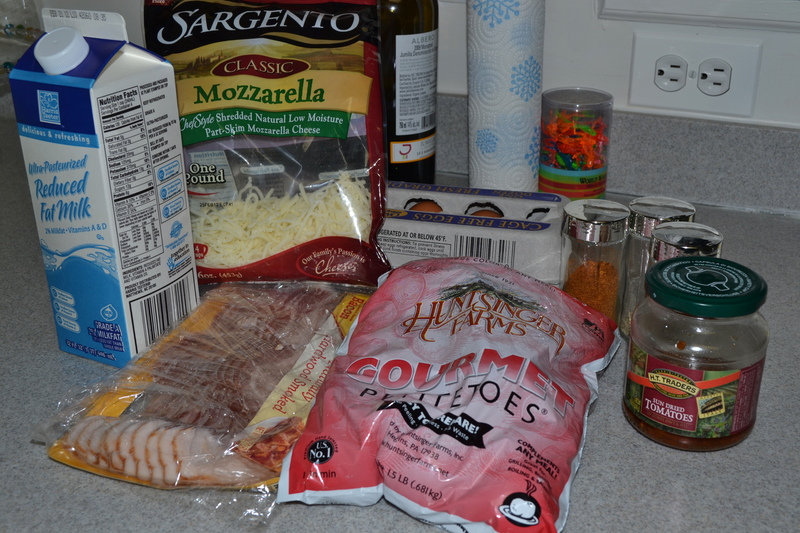 Tonight I bring you the second recipe in my 5 day quest to create meals and use up all of the ingredients in my fridge. Plus-I am about to share an easy and unbelievably delicious meal with you. Minus-you will seriously need to get your cholesterol checked after consuming this meal. This meaty fritatta is not for those on a diet, or frankly the faint of heart. You’ll need a serious appetite to put this down. Dare I say this would also be an ideal hangover fix. Preheat your oven to 350 degrees. Fill a large pot with water and set on high to boil. 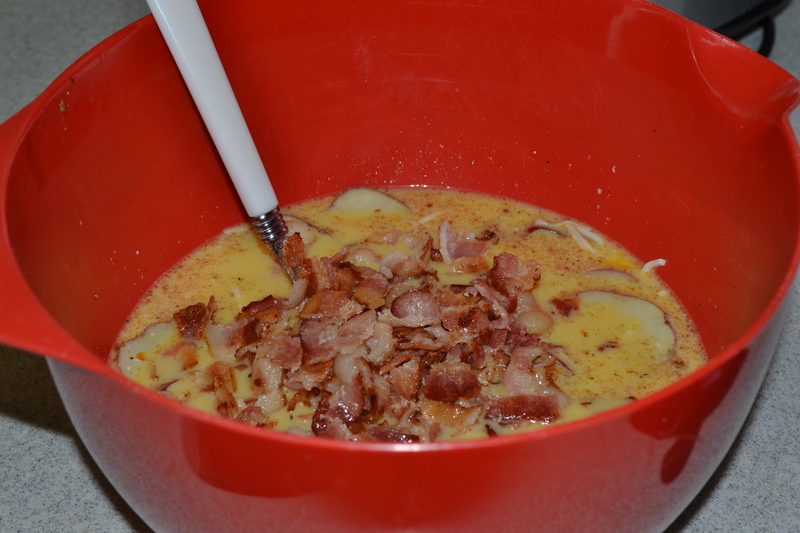 At the same time put several strips of bacon in a deep pan/shallow pot to cook. Check your bacon after 2-3 minutes and flip. While your bacon is cooking, rinse your potatoes and start to cut them into very thin slices. I’d recommend using a mandolin on a fine setting to cut them quickly and thinly. If you are like me and didn’t have one handy (read already packed), carefully cut the potatoes into thin slices using a sharp knife. After you finish slicing the potatoes, drop into the boiling water and cook at a boil for 2 minutes. Your potatoes will not be cooked through. Don’t worry they will see the inside of an oven soon! 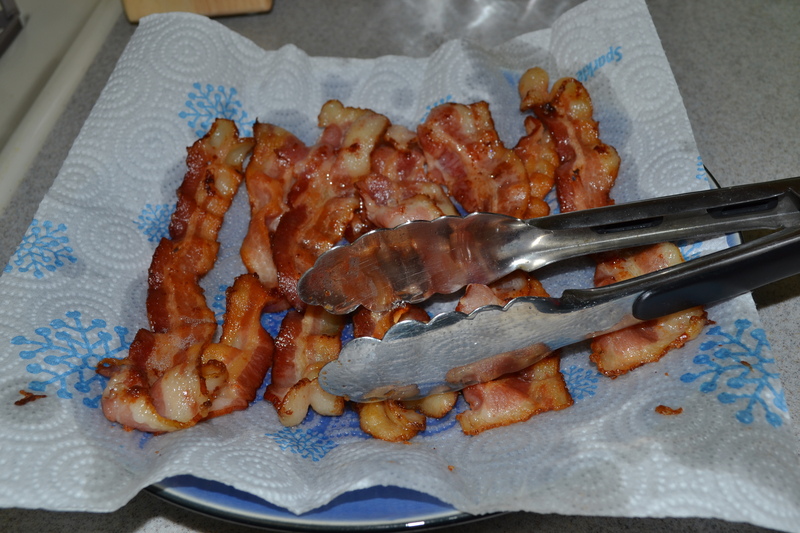 Transfer cooked bacon to a paper towel-lined plate and reserve your bacon grease (yum) off the heat on a back burner. Sprinkle a little salt, pepper and paprika in the grease. Afterwards drain your potatoes and set to the side. In a large bowl lightly scramble your eggs. Combine eggs with cheese, sun-dried tomatoes, and remaining tsps of paprika, pepper and salt. Stir until combined, then add potatoes and bacon, tearing it into tiny pieces. 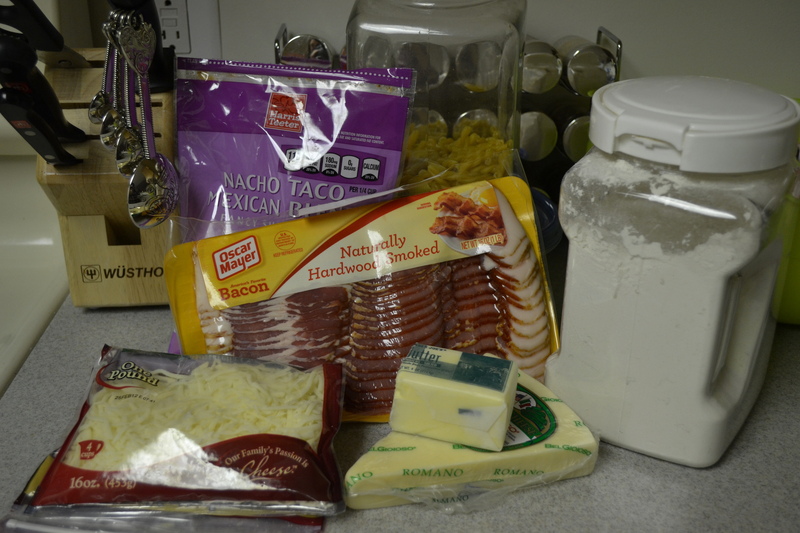 Gently stir all of these ingredients together and pour into your bacon grease in the pan. Put entire pan in the oven and cook for 20-23 minutes at 350 degrees. Carefully remove fritatta from the oven using an oven mitt as your pan and handle will be very hot. 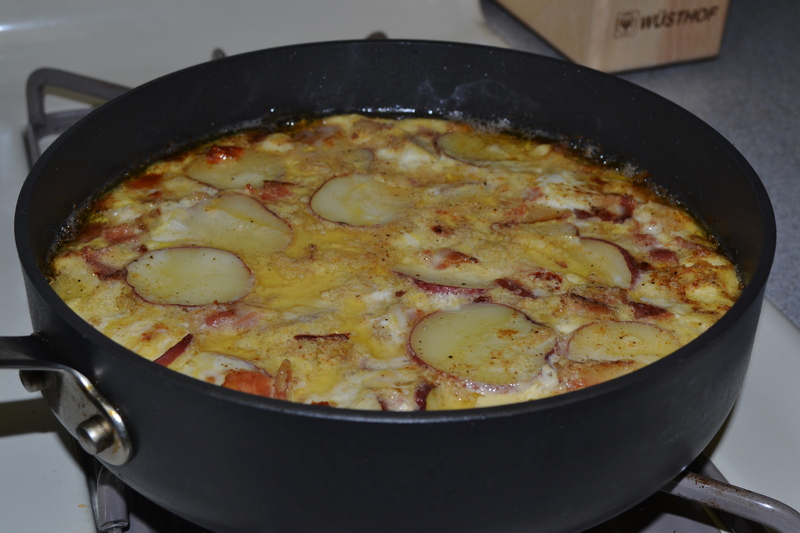 Your fritatta should be set and should not move if you give it a little jiggle. Let it sit for 10 minutes to cool and gently flip it over onto a large plate. Cut into wedges and serve warm or at room temperature. Greasy goodness! This was really good and I lucked out with the stuff in my fridge. You can substitute chorizo, take out the cheese, and add in caramelized onions if you want to make a traditional style Spanish torta. Today starts the first day of my moving out meals! I’m moving apartments this Saturday, and will be writing recipes that help me use up the food in my kitchen (read allow me to procrastinate instead of pack). My first recipe of the week also happens to be my favorite meal. 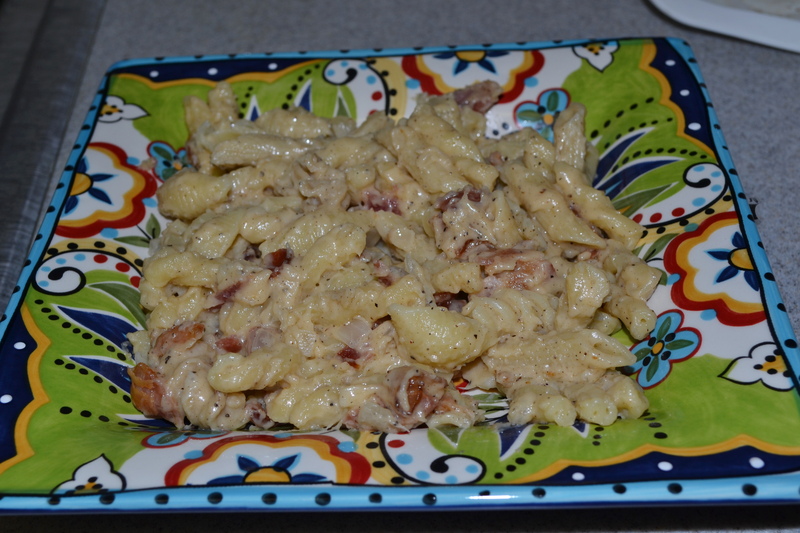 Tonight I made a creamy Mac & Cheese, and topped it with crunchy and salty bacon. I just ate a plate of it, and already my mouth is watering at the thought of leftovers. In a large saucepan melt butter over medium low heat. 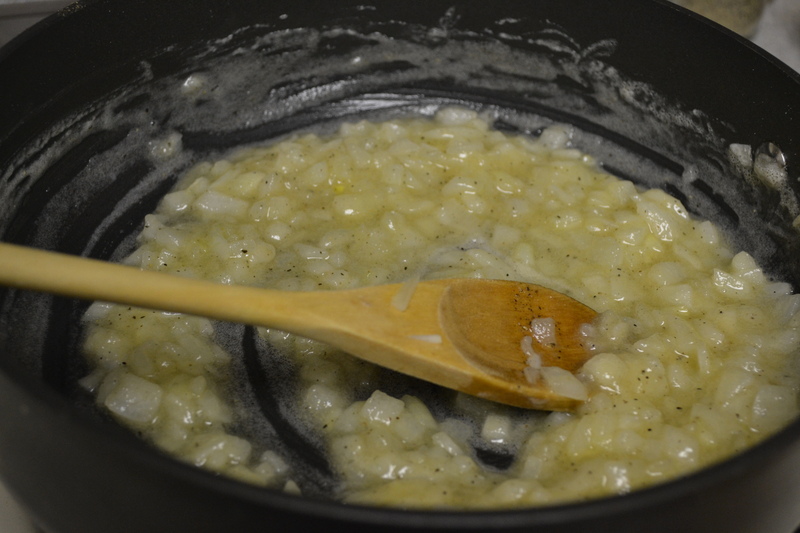 Add onions and saute for 3 mins. Whisk in flour and let cook over medium low heat for 2 minutes. Add a sprinkle of pepper. Your quick rue should look like the picture below. Put a pot of water on to boil. While the water is coming up to temperature, gradually whisk in the Mexican blend of cheeses to your onion and butter mixture until smooth. 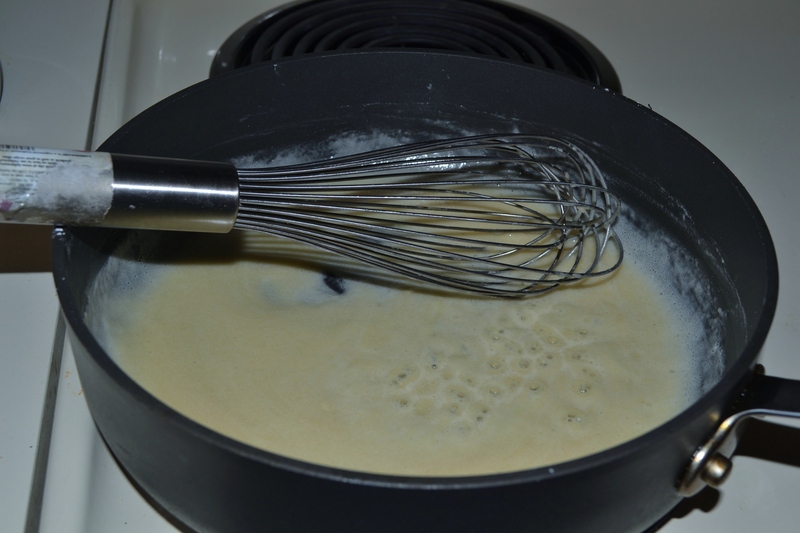 Reduce the heat on your cheese mixture and slowly whisk in a cup of the milk to the mixture. Add the salt, ground mustard, and the remaining pepper to the cheese mixture and stir. Now gradually whisk in the mozzarella cheese and remaining milk. 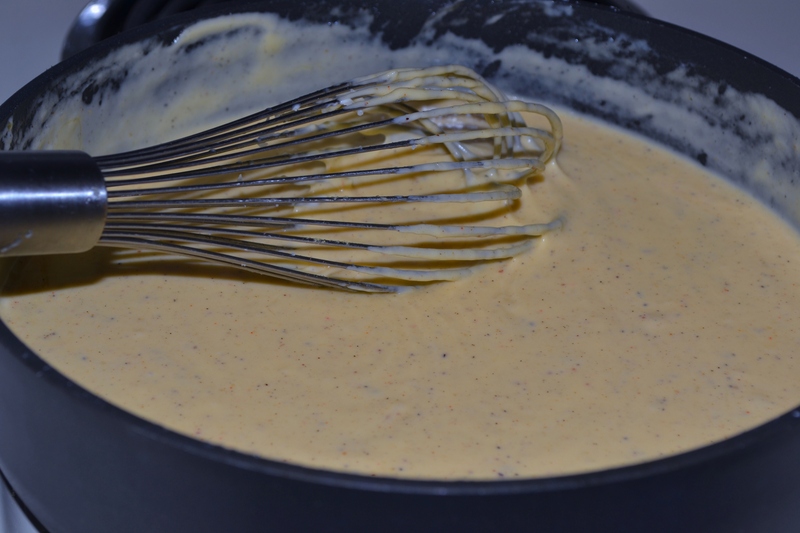 The cheese mixture be will thick and pale in color. Add a dash of nutmeg to your sauce and turn down the heat to low. Stir sauce periodically as you prepare the rest of the meal. 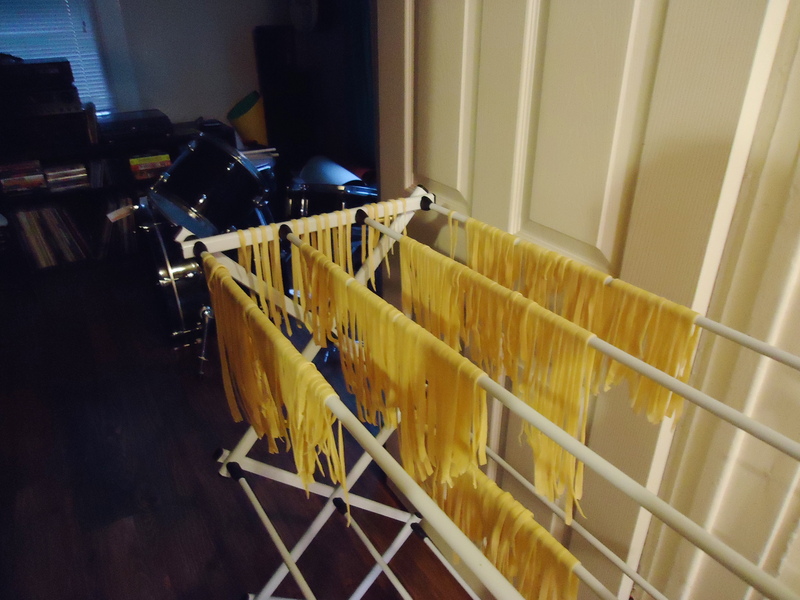 Add pasta to your boiling water and cook for about 6-8 minutes. 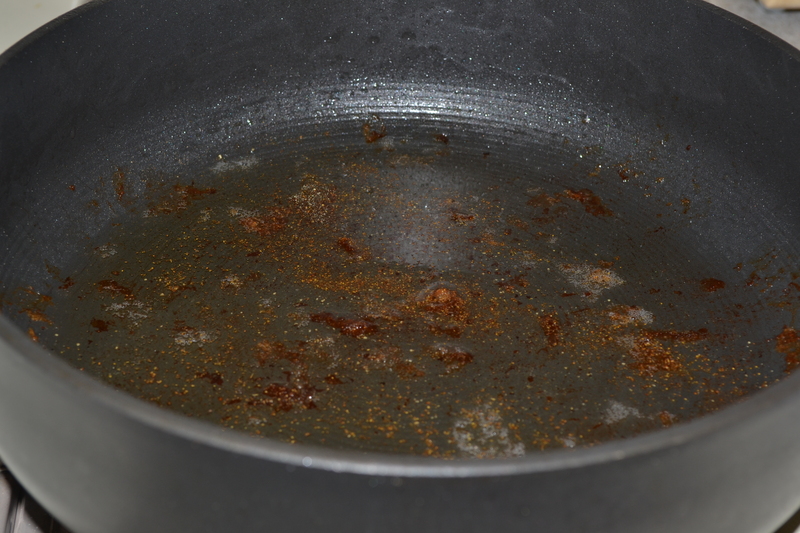 While the pasta is cooking, spray some non-stick spray on a pan and throw on your bacon over medium high heat. The bacon should take about 4-5 minutes to crisp up. 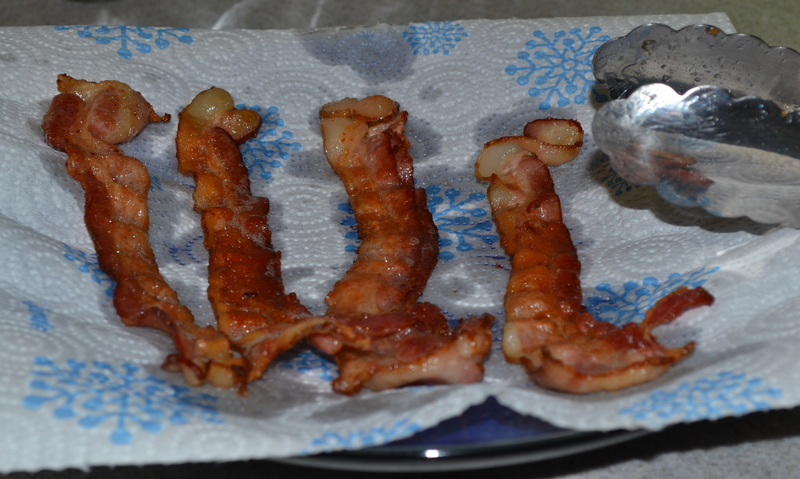 Transfer bacon to a paper towel-covered plate. Drain the cooked pasta and add it directly into the cheese sauce. Stir until combined, then crumble crisp bacon over top. This was the ideal dinner. 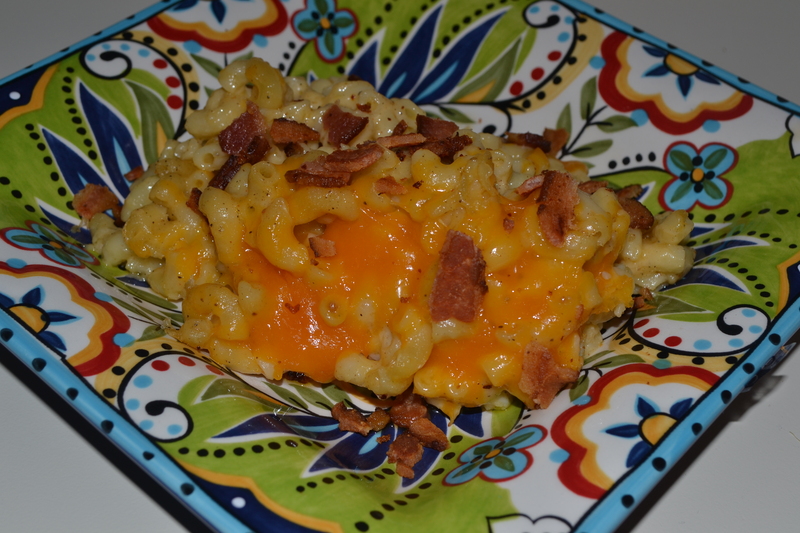 The onions and nutmeg gave the mac & cheese a hint of sweetness, the cheese and ground mustard added a nice tang, the pepper gave it a hint of heat, and the bacon some salty crunch. Tonight my procrastination was rewarded. Remind me of that tomorrow, when I’m buried in boxes! Are you all enjoying this lovely three-day weekend? I know I am! It’s been so nice to have an extra day to relax after several days of events and errands. It also gave me time to catch up on my blogging for Imperfectly Delicious and Pamela’s Punch. And boys and girls, I have a rave review for you! First let me preface this review by saying I grew up in a family of foodies. My parents always used fresh ingredients in the kitchen and on the grill. Which makes me appreciate restaurants like Volt, who really focus on using seasonal produce and local farmers. That might make me sound snobby (my nose is in the air as I type), but I think you’ll all agree that at least 90% of the time fresh food just tastes better. All of this is to say that my family was pre-disposed to like Volt for this reason, oh and because of the unbelievably positive press surrounding the restaurant. My family arrived about 30 minutes early to the restaurant, shocking given DC traffic on a holiday weekend. The friendly hostess team took our coats and seated us immediately in a simple and chic dining room. The dining room had cream-colored artistic lights, bright white table cloths, and vivid orange menus. The multiple servers brought us drink and wine menus and enthusiastically described the artisanal cocktails. I was freezing, so ordered a Hot Buttered Rum and my parents both settled on the Enclave. 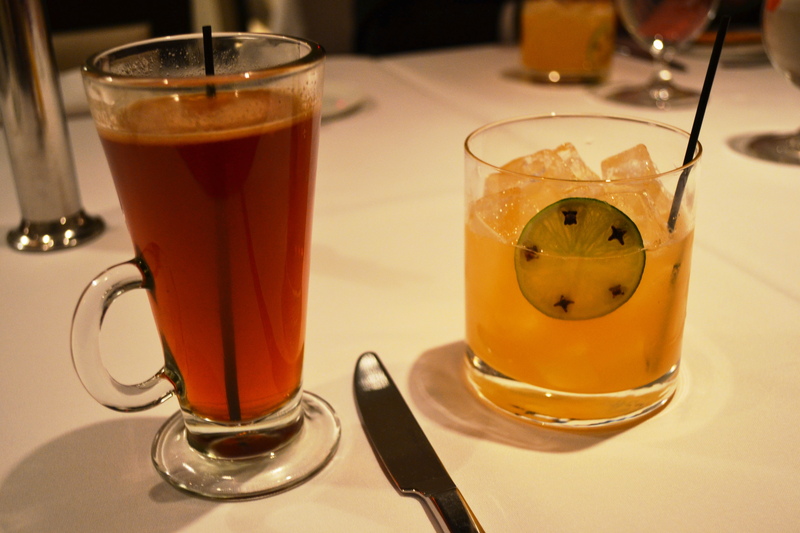 Both drinks packed a punch and warmed us up quickly! We stalled and snacked on house-made bread sticks dusted with fennel pollen, as we waited for my sister to arrive. The servers were pleasantly patient and didn’t rush us in the slightest. Once she arrived one of our servers (we had many) described the menu ordering options in detail. At Volt you can either order a seven course protein-based tasting menu, a seven course produce-based tasting menu, or a four course menu that combines the two. Our table opted for the four course tasting menu. 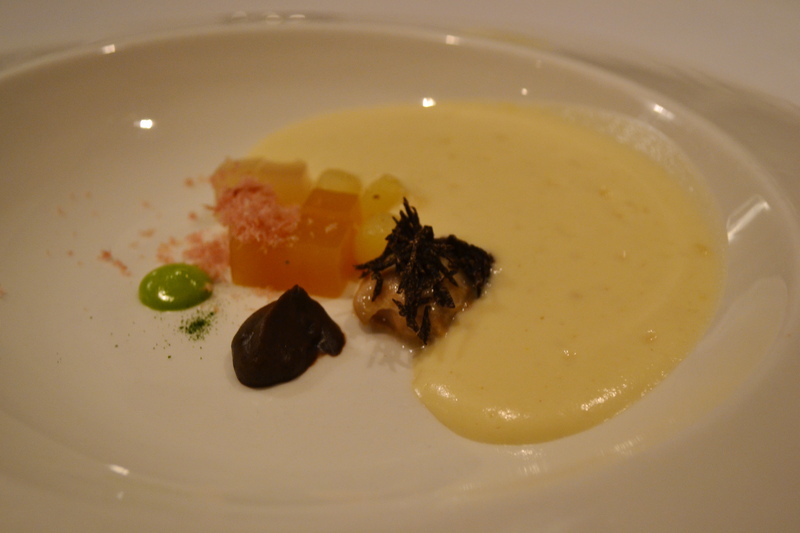 My first dish was the Oyster, Smoked Potato, Truffle and Bacon chowder. This deconstructed soup was creatively displayed, and once combined, all of the ingredients formed the best chowder you ever ate. Light and creamy with pleasant bite from the potatoes. My second course was a recommendation from a friend. 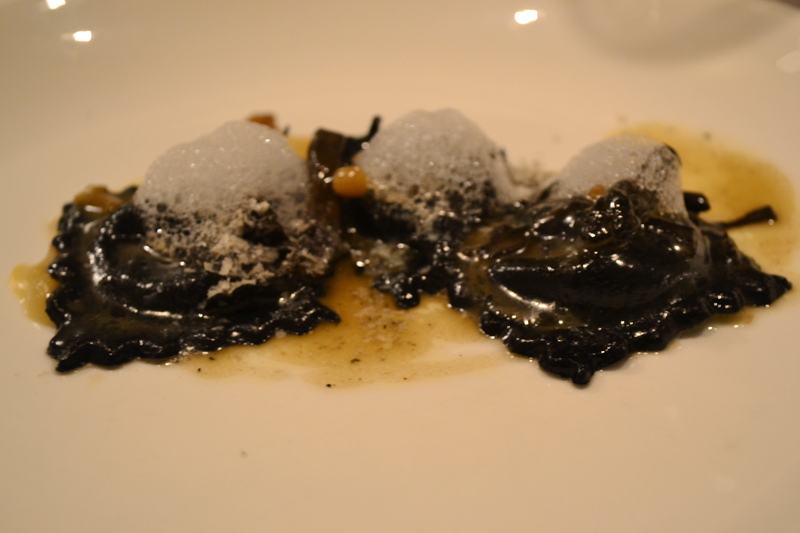 I ordered the tangy Goat Cheese Ravioli with Chanterelle Mushrooms, Parsley Root Ash, and Sage Foam. The pasta was spectacular! I would have probably left the restaurant happy just by ordering this one dish. The goat cheese was tart and creamy, and the mushrooms and sage gave the dish a deliciously woodsy flavor. If you go to Volt this dish is a must-order item. At this point the restaurant sent over their Wine Director to assist us with the expansive list. Jill enthusiastically guided us through the menu, and helped us to select the perfect bottle for our tastes. I loved talking to her and listening to all of the stories behind the different wines. For my third course I went against the table and ordered the Pork Shoulder, Sunchoke, Onion, and Cabbage. 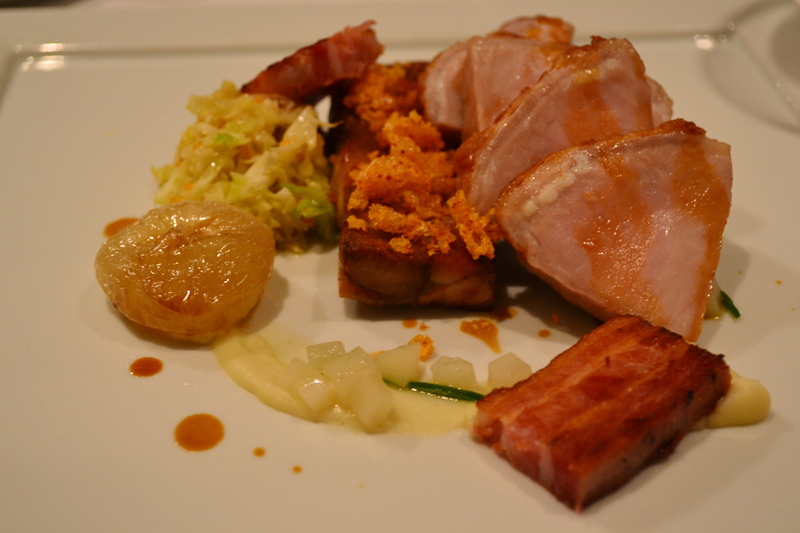 As you can see from the image above, this dish way exceeded my expectations in terms of types of pork on the plate. I not only had a nice portion of the pork shoulder, but also some pork belly and a sparerib. The onions were the perfect complement and added a bit of sweetness to the dish. The rest of the table ordered the Lobster, which was also outstanding. I sampled a bite because it looked so pretty! 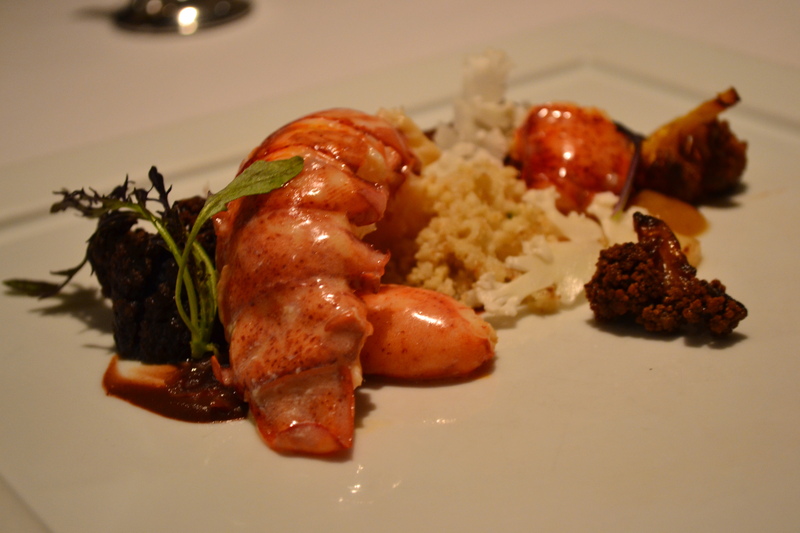 The lobster was perfectly cooked with just a touch of sweetness. 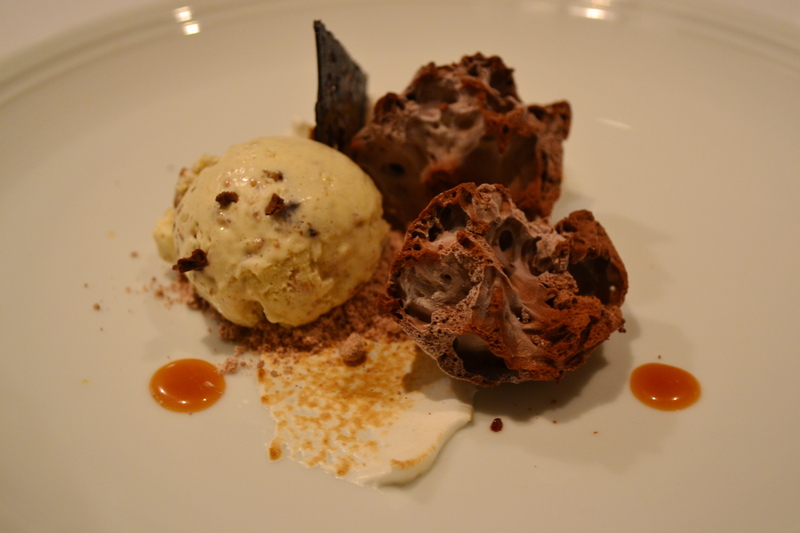 My fourth course was dessert (yay), and I selected the Chocolate Marshmallow with Caramel and Peanut Ice Cream. Oh heavens, my mouth is watering just thinking of it now. I loved the rustic look of the dish and the playful touch with the gourmet marshmallow fluff. I wanted to lick the plate. I would have too if I wasn’t so busy staring at the gorgeous plates around me. Check out my dad’s striking dessert of the Peppermint White Chocolate and Eggnog Gingerbread. 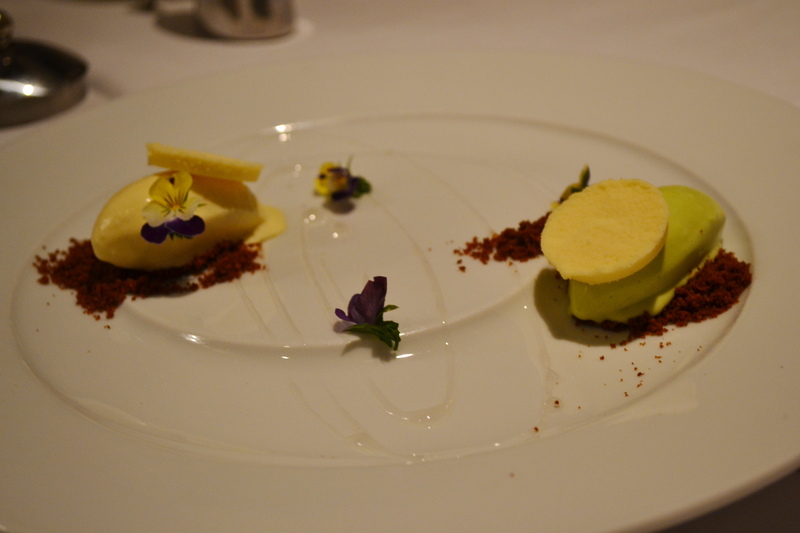 How clever to take traditional flavors from the Holidays and reinterpret the presentation to invoke thoughts of Spring. Oh but we weren’t finished yet! 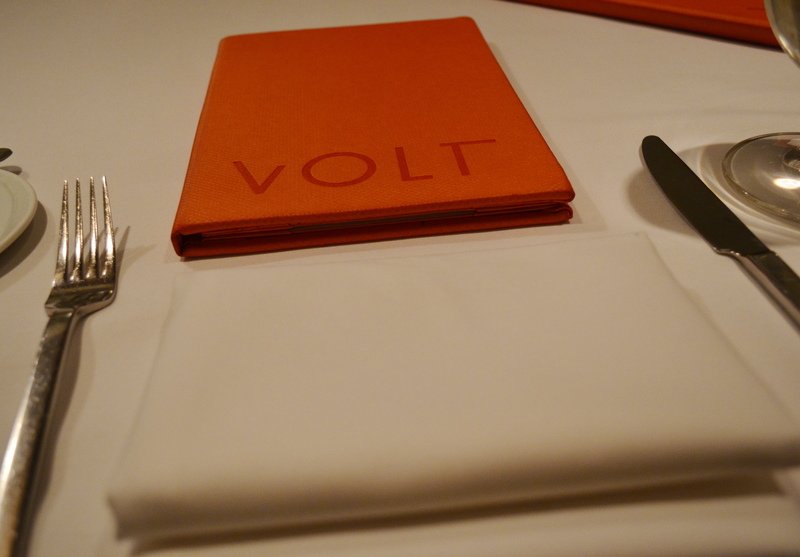 Our four-course meal also included Volt’s complimentary tray of sweet bites to round out the meal. These included chocolate and coffee macarons, house-made gelee, a fennel marshmallow, and hazelnut espresso truffles. Two trays were delivered for our table of four! This meal was absolutely divine. In fact, it doesn’t even seem fair to call it a meal, it was more of a dining experience. This dinner ranked up with the top five meals of my life. The food was superb, and Chef Bryan Voltaggio elevated classic flavors with his witty, artistic presentation. 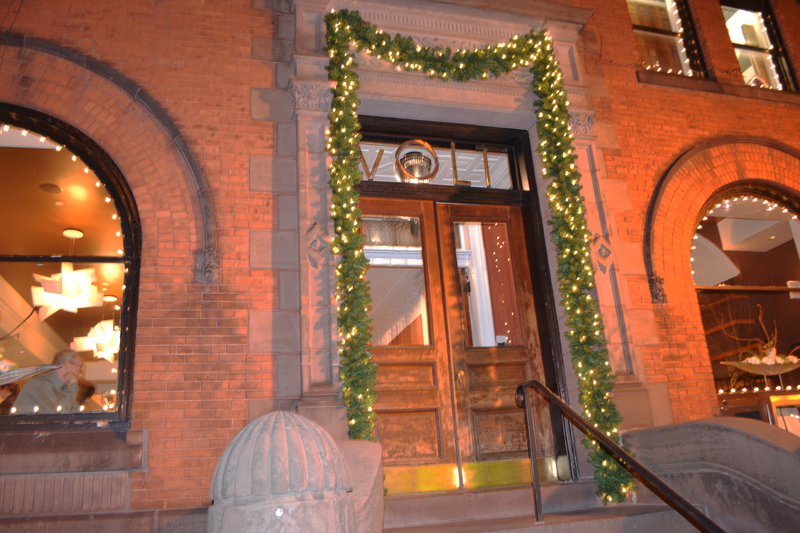 I would also like to say the entire staff at Volt were knowledgeable and welcoming. I can’t tell you how many times I’ve been rushed through a dinner, but they let us truly enjoy our meal at a relaxed pace. Hands down the best service I’ve ever experienced at a restaurant. Finally, I know that $80 can seem like a lot to spend on a four-course dinner. Our dinner was actually more like a seven-course dinner, and included the four courses described above with the bread course (bacon brioche! ), complimentary dessert bites, and house-made granola to–go delivered with our check. My overall rating is an A+ for Volt. Truly inventive and delightful food and worth every bit of traffic. Thanks to my fabulous family for the reservation, meal and company! 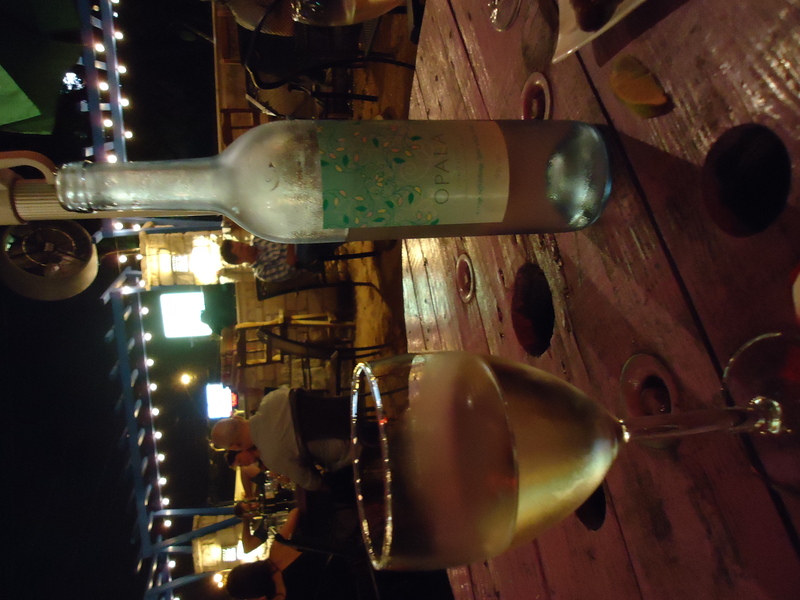 As previously mentioned, I ate and drank my way through Austin this weekend. What a perfect way to explore the city and culture! 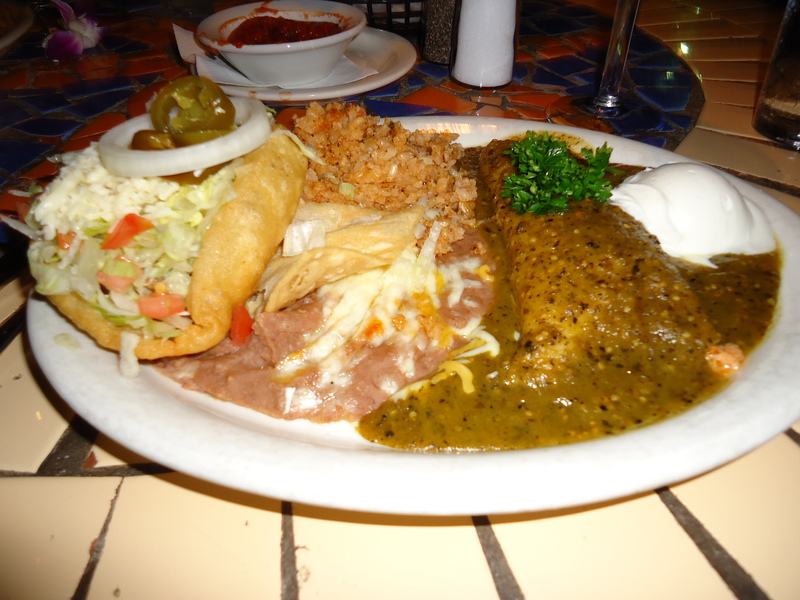 Austin is known for it’s Tex Mex cuisine, and it did not disappoint. 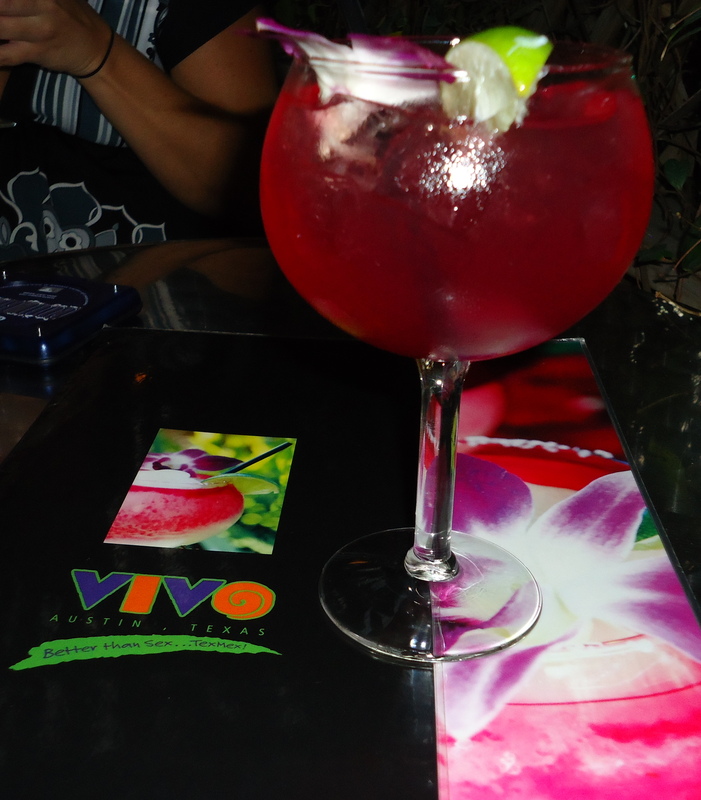 My first night in town we went to a beautiful restaurant called Vivo. The restaurant decor was funky, and included little touches like ice in the bathroom sinks and pink parting roses for female guests. I ordered a beef puffy taco and a chicken enchilada with tomatillo sauce. The puffy taco was lightly fried without being greasy, and the tomatillo sauce added a nice acidity to the deliciously cheesy enchilada. 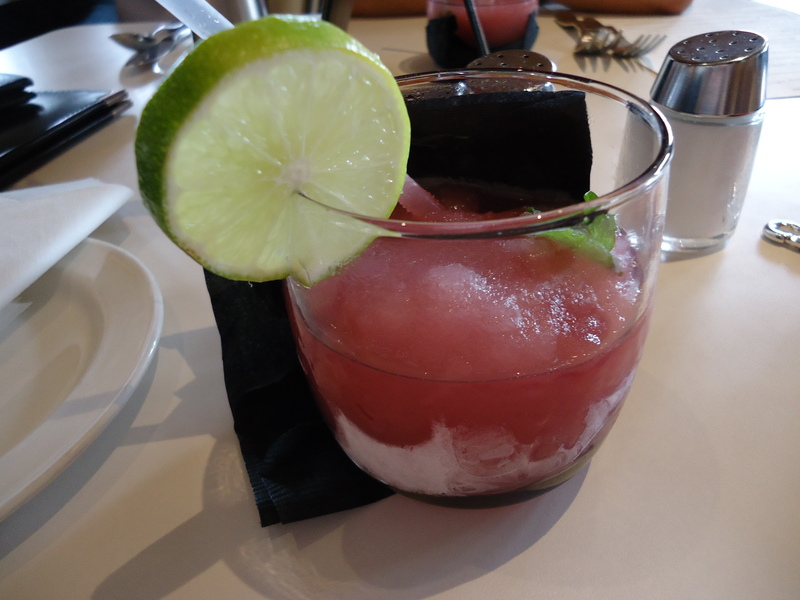 The best part of my meal was definitely the prickly pear margarita. Not only was the drink beautiful, but it was nice to try something new that I can’t find in DC. The following morning we stopped into the South Congress Cafe for brunch. Julie and I drank blackberry mojitos with fresh mint from the bar while waiting to be seated. I had a very difficult time deciding on my brunch entrée, but ultimately settled on the steak and migas benedict with a chipotle hollandaise sauce and potato and chive pancake. 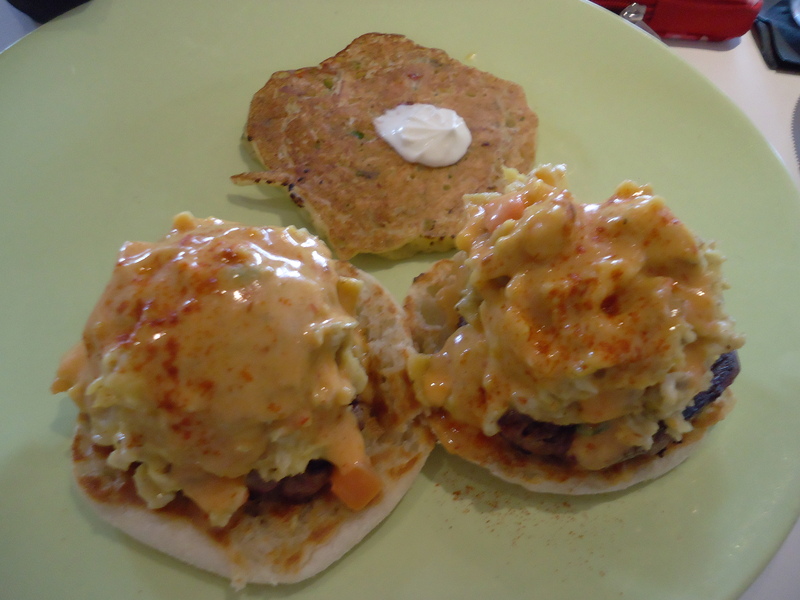 The steak was tender and I actually liked the migas on top of the benedict for something different. The whole meal was very yummy, inventive and surprisingly cheap! After brunch we walked around the SoCo neighborhood, drove past Lake Austin, and even caught an Australian Rules Footy Match. 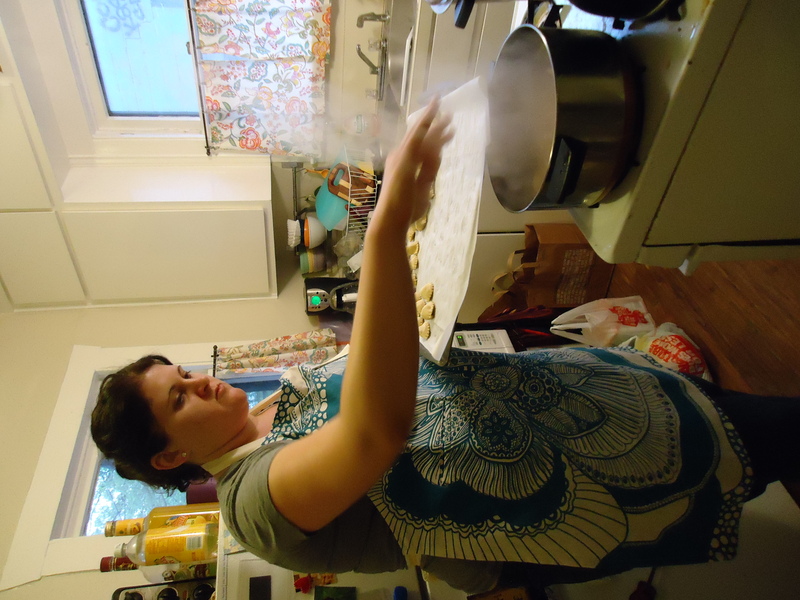 Then we headed to Erin’s home to learn how to make her family’s recipe for Capaletti pasta. Please note Erin’s adorable apron. This stuffed pasta looks like a smaller version of ravioli, and has a delicious filling of cheese, herbs and breadcrumbs. The whole dish is served in a warm, comforting broth. I’m sure you’re all dying for this recipe (trust me, you wish you could try it). 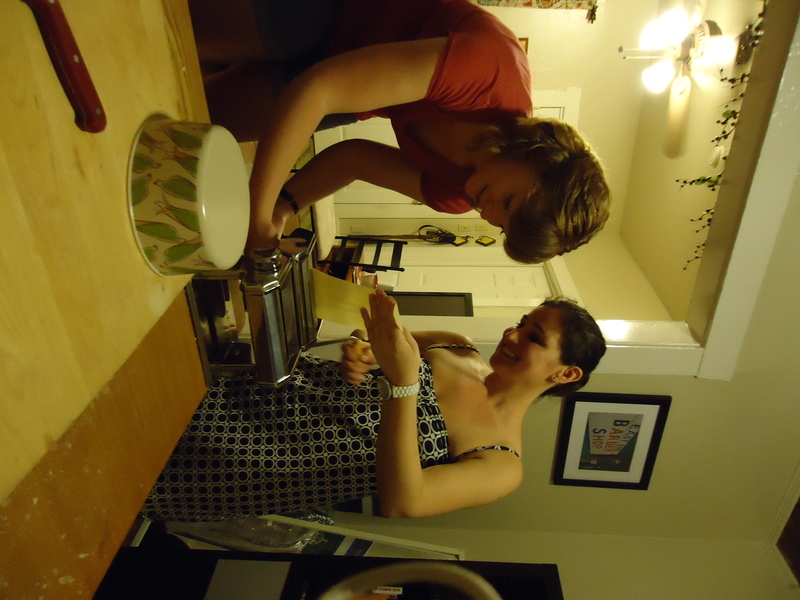 These sisters make a killer pasta, and I hope I can convince them to make it the next time I’m in Austin. Thanks so much to Erin and Jenna for letting me “help” roll out and cut the pasta. I’d also like to give a shout out to Beth for her patience while teaching me how to work the machine. My last meal in Austin was at a new restaurant named Bacon. MMMMM! 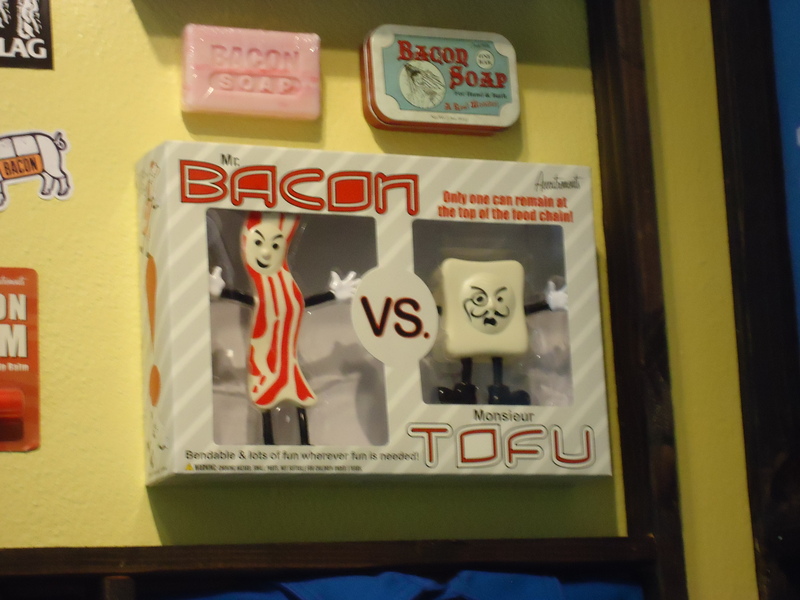 The restaurant incorporates bacon in all dishes including dessert. 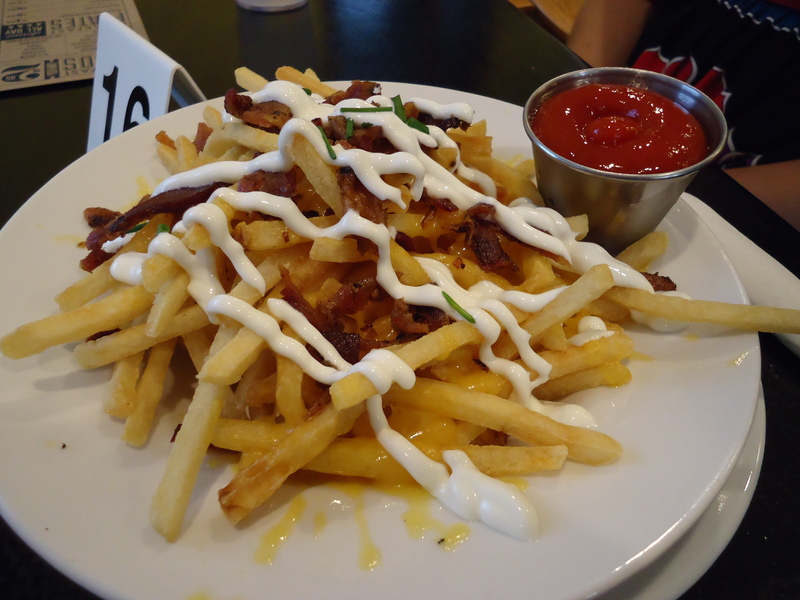 We all split an appetizer of bacon, cheese and ranch fries, which were good but nothing groundbreaking. My breakfast was the maple bacon stuffed waffles with bananas and syrup. The waffle was both crisp and chewy and I loved the taste of the bacon inside, but found the strips a bit difficult to cut. The food and company in Austin were superb! I can’t wait for my next trip there. Anyone got any other restaurant recommendations? Hey y’all! 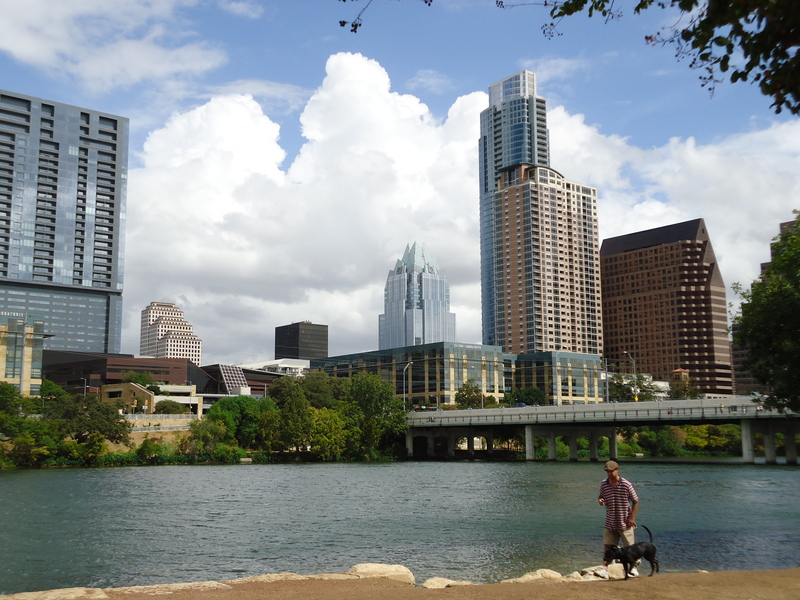 I just got back from an amazing weekend in Austin, Texas. It was my first time, and now I see why everyone loves it. Here are a few highlights of my trip, and I’ll have a follow-up post this week with restaurant reviews and pictures from a fun impromptu pasta-making party :). A special thanks to my friend Julie for being the best host and showing me an epic weekend. Cheers! 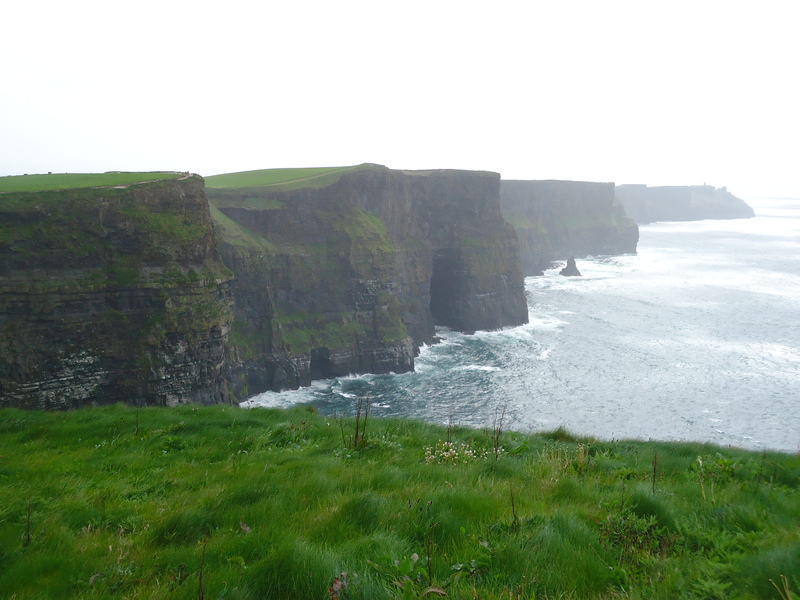 Recently my family and I took a trip to Ireland. 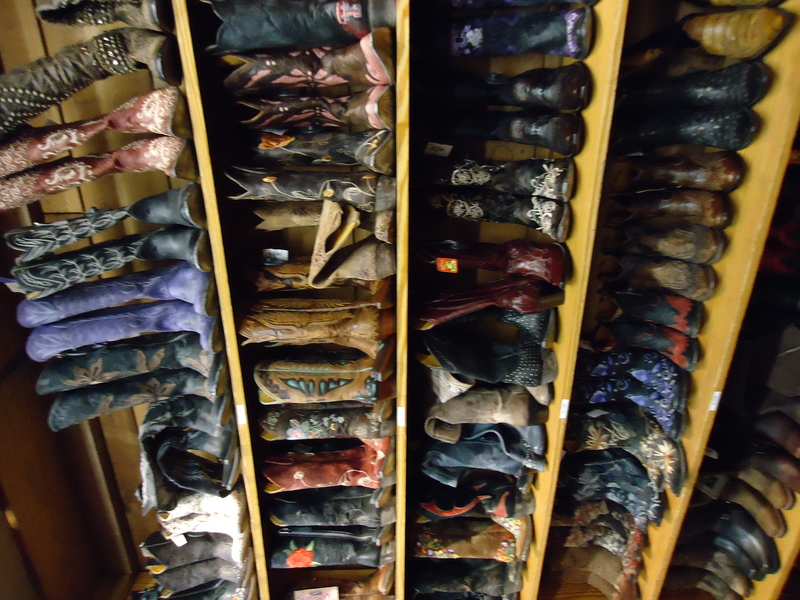 We were there for eight glorious days driving all around the country. Actually, make that eating and drinking all around the country! Here are my pictures from the first part of our culinary journey in Dublin. Our trip started off right with a stop to the Guinness Brewery. How else were we supposed to battle jet lag? This is my photo of the perfect pour. 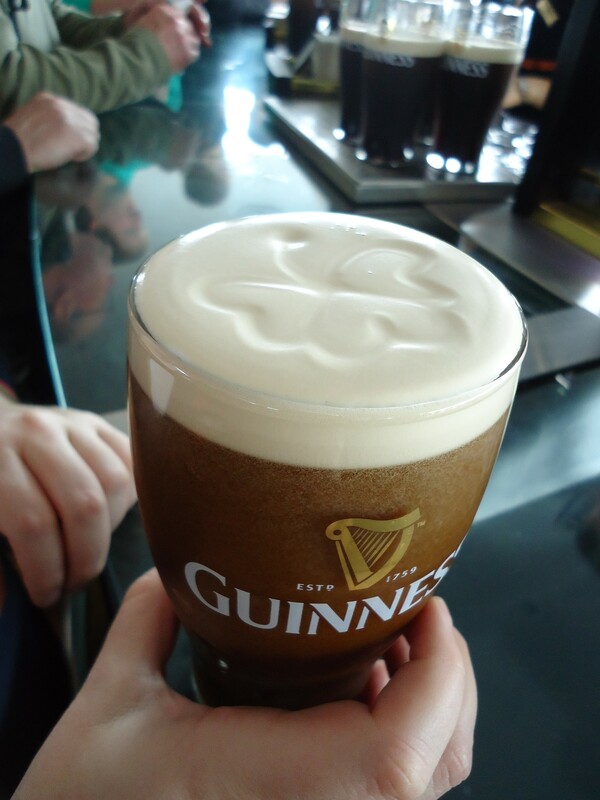 Could it get more Irish than a Guinness with a shamrock in the foam? Mmmmm stout! Let’s just say my family made it a priority to grab at least one pint each day and try out each city’s brew including Murphy’s and Beamish. The following morning we got up and were ready to take on Dublin! We stopped for a delicious breakfast at Lemon, which was a very casual creperie. There were a zillion options and my favorite included the bacon and egg with the tomato marmalade. 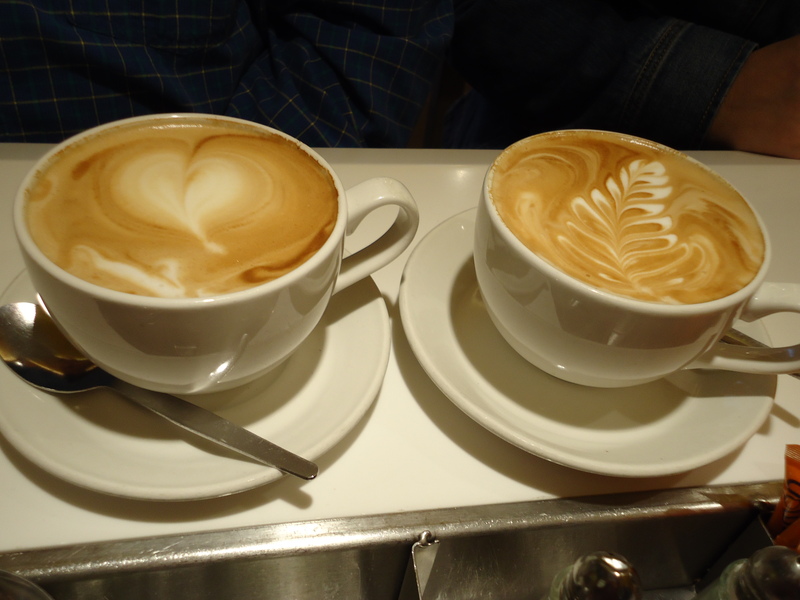 Oh, and did I mention their gorgeous cappuccino and coffee? After fueling up we were ready to take on Dublin. We met up with our graduate student tour guide at Trinity College and covered most of the city in just two and a half hours. We ended our walking tour in the bustling area of Temple Bar. Famished and seriously parched, we stopped off at Gallagher’s Boxty House for dinner. 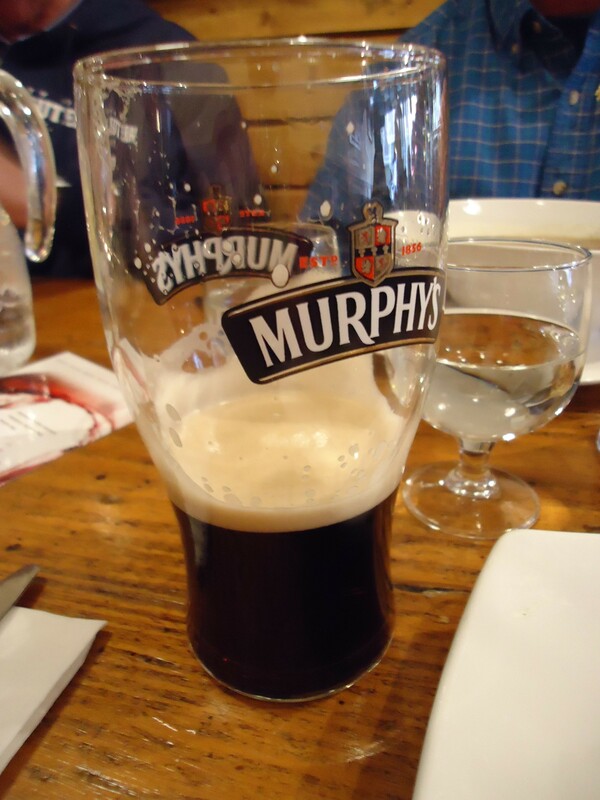 I had a great seafood chowder, a pint of Murphy’s, and the star was the lamb boxty. 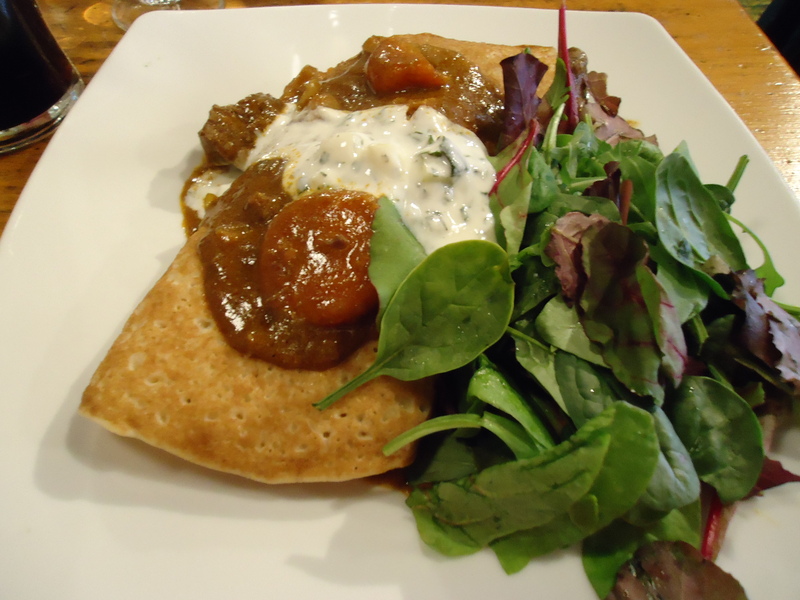 The boxty was like a thicker wheat-based crepe filled with lamb stew and topped with a yogurt sauce. Talk about comfort food on a rainy day. And for my dessert I had a bit more of this. 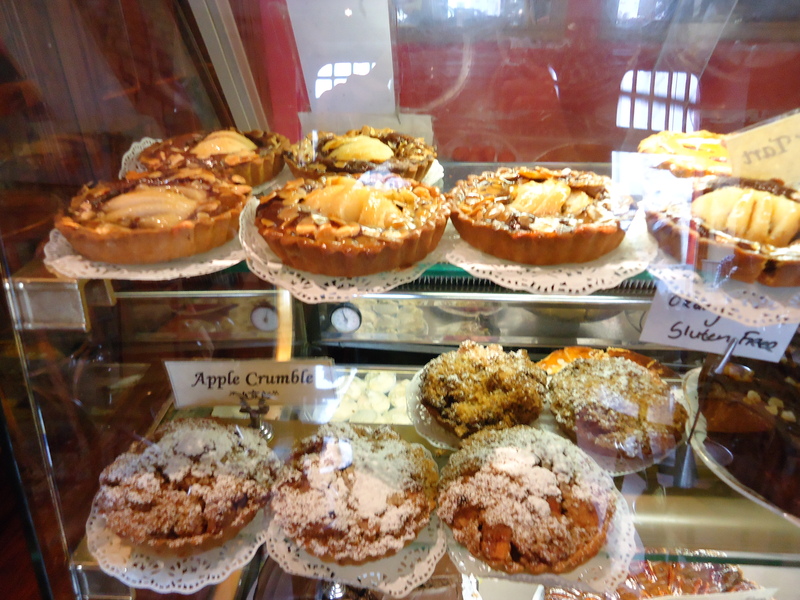 The following morning my sis and I left the hotel in search of a killer breakfast and found ourselves at the Queen of Tarts. 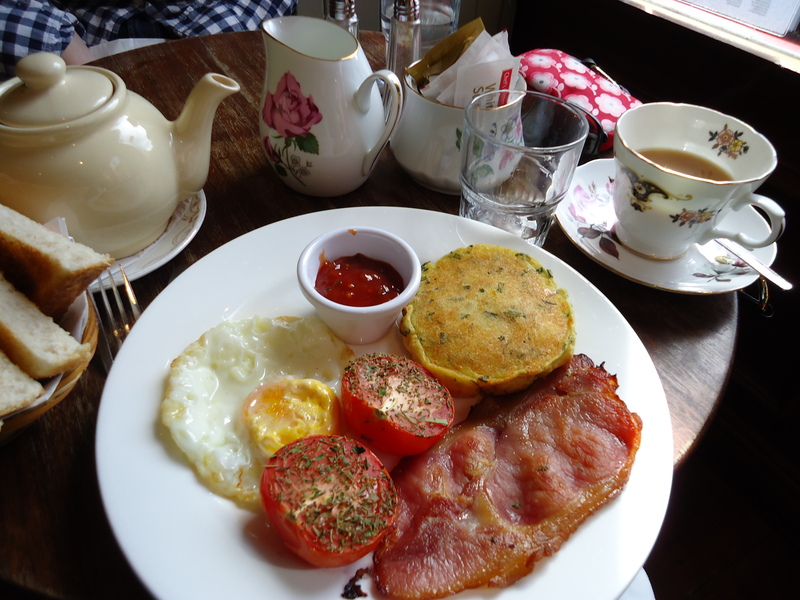 I had a pot of tea and a delicious savory breakfast of bacon, poached tomatoes, a fried egg, and a potato and chive cake. As far as I’m concerned there was no better way to start our day. My only wish would have been to leave more room so I could have eaten breakfast dessert like these! That’s all for part 1 of my meal pictures from Dublin. Stayed tuned for part 2 which picks up in Galway!